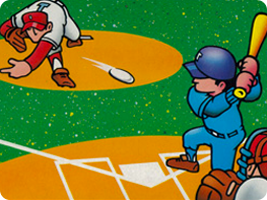 Nintendo's very first sports title on the NES was 1983's Baseball. While more simple than the sport itself, the game was more complex than many other sporting titles of the time, and set the standard on which many other baseball games were based. Nintendo has continued to produce baseball titles through the years, even hiring in professional talent such as Ken Griffey Jr. to be the face of the series. 25 May 1998 Nintendo 64 Major League Baseball Featuring Ken Griffey Jr.